Wiki software is a kind of collaborative software that runs a wiki system. This usually allows web pages to be created and edited using a common web browser. It is generally implemented as a software engine that runs on one or more web servers, with the content stored in a file system, and content changes kept in a relational database management system. In addition to the Wiki engine itself that employs the wiki technology, Wiki software could include all of the software required to run a wiki, which might contain a web server such as Apache. In some cases, like in ProjectForum, or in some WikiServers, the web server and wiki engine are bundled together as one self-contained system that can often make them easier to install. 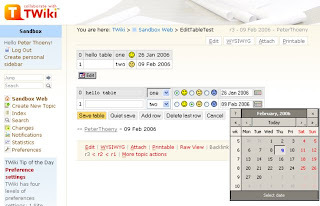 TWiki is a structured wiki, typically used to run a collaboration platform, knowledge or document management system, a knowledge base, or team portal. Users can create wiki applications using the TWiki Markup Language, and developers can extend its functionality with plugins. MoinMoin is a wiki engine implemented in Python, initially based on the PikiPiki wiki engine. The feature set of fine grained access control, simple user groups, GUI editor, easy install, simple but efficient spam protection, easy theming combined with a simple code base makes it often the wiki of choice for many open source projects like Apache, Debian, Ubuntu, and Fedora, as well as many corporate wikis. MediaWiki is a web-based wiki software application used by all projects of the Wikimedia Foundation, all wikis hosted by Wikia, and many other wikis, including some of the largest and most popular ones. Originally developed to serve the needs of the free content Wikipedia encyclopedia, today it has also been deployed by companies for internal knowledge management, and as a content management system. Notably, Novell uses it to operate several of its high traffic websites. MediaWiki is written in the PHP programming language, and can use either the MySQL or PostgreSQL relational database management system. 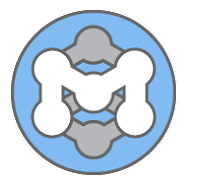 MediaWiki is distributed under the terms of the GNU General Public License while its documentation is released under the GFDL and partly in the public domain, making it free and open source software. The current software was originally written for Wikipedia by Lee Daniel Crocker, based on the user interface design of Magnus Manske, a developer and student of the University of Cologne. Wikipedia had originally used a small wiki engine called UseModWiki written in Perl. Wikipedia was later switched to Manske's PHP-based software to offer more functionality. Increasing usage caused load problems, leading Crocker to re-write the software with a more scalable MySQL database backend. Later, Brion Vibber would take up the role of release manager and most active developer. 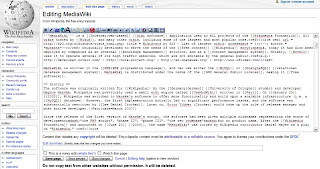 PmWiki is free wiki software written by Patrick R. Michaud in the PHP programming language. 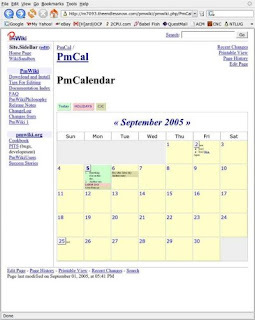 PmWiki is designed to be easy to install and customize as an engine for creating professional web sites with one to any number of content authors. The software focuses on ease-of-use, so people with little IT or wiki experience will be able to put it to use. Despite having such low barriers to install a basic wiki, the software is also designed to be extremely extensible and customizable. The PmWiki wiki markup shares similarities with MediaWiki (used by Wikipedia). The PmWiki markup engine is highly customizable, allowing adding, modifying or disabling markup rules, and it can support other markup languages. As an example, the WikiCreole specifications can be enabled. DokuWiki is wiki software aimed at small companies' documentation needs. DokuWiki is licensed under GPL 2 and written in the programming language PHP. It works on plain text files and thus needs no database. Its syntax is similar to the one used by MediaWiki and makes sure the data files remain readable outside the wiki. * Revision control - stores all versions of each wiki page, allowing the user to compare the current version with any older version. * Access control - can be handled by a user manager which allows users and groups of users to be defined, and an access control list where an admin user can define permissions on page and namespace level. * Plugins - has a generic plugin interface which simplifies the process of writing and maintaining plugins. There are over 300 plugins available. * Templates - the appearance of the wiki can be defined by a template. There are already various templates provided by the development community. * Internationalization and localization - supports Unicode (UTF-8), so languages such as Chinese, Thai, and Hebrew can be displayed. DokuWiki can be configured in about 40 languages. * Caching - stores the rendered output of parsed wiki pages to reduce server load. * Full text search - has an integrated indexed search with which a user can search for keywords on the wiki. What wiki software are you using? Tell us about it by leaving us a comment. And what about about XWiki?!?! I read this article fully regarding the difference of most up-to-date and earlier technologies, it's remarkable article.